Stone:- Stone sculptures are the ancient activity where the natural stone pieces were shaped by controlled removal of the stone. Owing to the durability of the stone used, evidence has been found that even the ancient societies were indulged in stone works. The stone sculptures of Egypt, Greece, and India are quite famous. The rock engravings are perhaps the earliest forms of stone sculptures. This involved the removal of parts of the rock surface that remained in situ by pecking, incising, abrading, and carving. The monumental sculptures cover the larger stone works. Hardstone carving includes stones like agate, jade, rock, onyx, crystal, and carnelian. Mineral gypsum or alabaster is a softer mineral, which is simple to carve for the small artworks. The engraved gems are the smaller carved gems including the cameos, previously used as the seal rings. The pointing technique involved setting up the grid of string squares on wooden frame that surrounds the original one. Then the position is measured on grid. Using the information, the block or sculpture is carved out. Metal:- Bronze and copper alloys are considered as the most preferred metals for casting the metal sculptures. Common bronze alloys are found to have an unusual yet desirable property of enlarging slightly prior to setting, thus filling in the details of the mold. The strength and ductility is the advantage when the figures in action have to be created, especially when these are compared to stones and ceramic. Casting is the sculpture manufacturing technique in which the molten metal is poured into the selected mold that contains the hollow cavity of the preferred shape and size and then it is allowed to get solidified. The solidified figure is then ejected in order to complete the procedure. The final stage is termed as the ‘cold work’. This process is adopted in case of manufacturing the complicated shaped sculptures that would not be possible to do with the other sculpture manufacturing techniques. Glass:- Glass is used for manufacturing sculptures through a broad array of manufacturing techniques. Hot casting may be done by ladling the molten form of glass into the molds, which have been developed by pressing the shapes into sand, silica molds, detailed plaster, or carved graphite. Kiln casting glass includes heating chunks of glass in the kiln till it is completely liquid and is able to flow into the mold. Glass may be blown or hot sculpted using hand tools either as a portion of the blown object or as a solid mass. Recent techniques like bonding plate glass with UV light and polymer silicates and chiseling. Wood Carving:- Wood survives less as compared to the other materials, being quite vulnerable to insect damage, fire, and decay. The outdoor wooden sculptures do not last for longer time periods. This may depend on the type of wood chosen to manufacture the sculpture. Wood is quite light. This property of the material makes it suitable for masks and other such objects. Fine detailed designs can be crafted on wood. It is easier to work with wood as compared with stones. Usually, a layer of plaster or gesso is applied to the wooden sculpture after carving is done, and then paint is applied if desired. 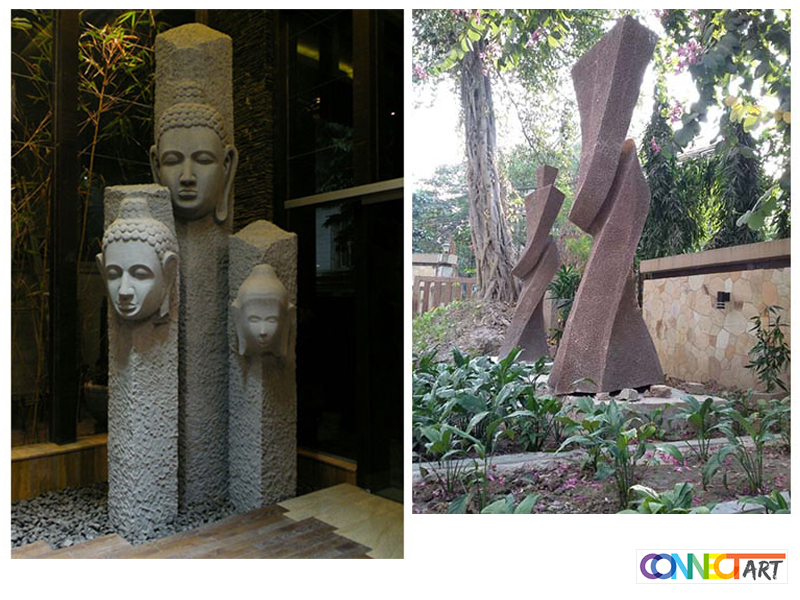 One can visit Connect Art Kolkata to get absolutely unique forms of customized as well as readymade sculptures.